We have been so impressed with the conformation and athletic ability of the "Wade" colts. We use many of them for our daily ranch activities as well as roping and barrel racing. We are currently keeping many of his daughters for broodmares and they are proving to be great producers. 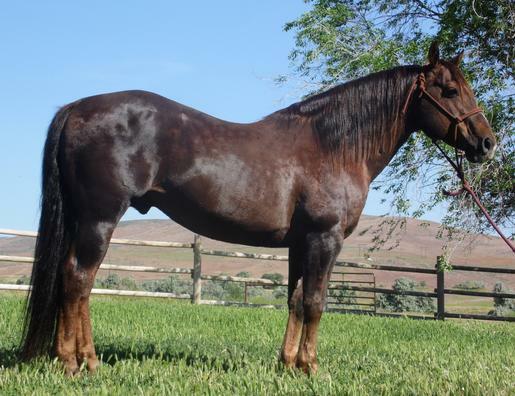 Wade is a great ranch horse himself and also a finished heel horse. We have been using "Brownie" for many years now and he has produced us some wonderful ranch horses. They are the kind that will go all day and not quit on you. We have used many of his daughters as broodmares as well. Our first crop of colts by "Tipper" are now two year olds and they are doing great. He has a lot of foot and bone and is very correct and passes this along to his offspring. One of his most valuable traits is his disposition which he most definitely stamps his colts with. So far they have been very quick and athletic. "Gila" is a large horse standing nearly 16 hands so we get a lot of size in his colts. They are proving to be great ranch horses with a few running barrels as well. Gila is used as a ranch horse and head horse himself. His colts have a lot of action. "Kuster" has an impressive amount of foot and bone and this most definitely shows up in his colts. The horses by him really want to "cow up". Kuster has been used as a ranch horse and rope horse.